Get these deals and more for annual subscriptions. Sat, Feb 2 & Sun, Feb 3, Select 2 Magazines for $10 at DiscountMags.com! Choose from Men’s Magazines, Women’s Magazines, Home & Garden Magazines and More! Subscriptions are NOT subject to automatic renewal. Get $25 Restaurant.com gift certificates for $4! Regularly $10, it is on sale for 60% off! Use code: BOWL. Deal goes through Tuesday, January 29, 2013! No expiration date on the certificate. A couple hundred restaurants with this deal in the northeast Ohio area. Restaurants like Pickwick, Mia Bella, the Mad Greek, Dave’s Cosmic Subs, Maxi’s, Lemon Grass, Grumpy’s Cafe, Taste, Melting Pot, Otani’s, White Oaks, Shula’s and many more! Restaurants are all across the U.S. – great to get when travelling! If the restaurant closes or doesn’t accept the certificate anymore, just call 1-888-745-6991 to have them credit the certificate so that it can be use on another restaurant. Get these e-coupons from Saving Star. All you need to do is register your store loyalty card to each coupon you want activated. Get $10.00 back when you spend $40.00 on Smart Ones before March 24. Now through February 20, 2013, save $5.00 when you spend $15.00 on any Snyder’s of Hanover Pretzels. Save $5.00 when you spend $30.00 on Barista Prima® K-Cup® packs – All 12-ct varieties included. You will also find eCoupons for Little Debbie snacks, Pillsbury products, Green Giant Veggie Chips, Dean’s Dip and a lot more. Get up to $100 of Free B&B Gift Cards – Give the Gift of Travel! Travelers can save $50 on an online reservation of two nights or more. Use code BBEND50 until January 31, 2013. So were you one of the cars that was doing 360s on the freeway? As fun as that may seem they are not fun when you end up in the median area facing the wrong direction. If your bald tires are not holding up well in this weather, check for some great deals and rebates on Tire Rack. Check their reviews, including the customer reviews on tires that work best for your car. Very helpful and the tires are at very low prices. Get deals on jewelry, watches, electronics, and tons of other items. Bonus deal this weekend on already discounted items! Discount: Extra 50% Off Everything! Get 35% off any Entertainment book through 1/31/13. Bring in your original DVD (no burned copies accepted) with the original case to Customer Service and receive a $5-off coupon valid on any Blu-ray movie priced $9.99 or more. See a Customer Specialist for more details about the Upgrade & Save promotion. Limit 5 coupons per trip for DVD upgrades. Valid on in-stock Blu-ray movies only. No cash value. Offer valid through 2/2/13. Receive 25% off any Canvas order at CVSphoto.com. Use code WALLCANVAS Offer ends 2.2.13. Save 25% on any gift order from CVSphoto.com. Use code VDAYGIFT Offer ends 2.2.13. Get 4×6 prints for just 10¢ each only at CVSphoto.com. Use code with code SMILE10 at checkout minimum 50 prints required. Offer ends 2.2.13. All leftover Christmas items are 25 cents each – no matter the original price. Giant Eagle now accepts competitors coupons. Chex Mix – Free after .50 coupon found at http://tinyurl.com/couponguycoupons – also get Profit after .50 coupon found at Saving Star. Look for coupons in newspaper and Parade magazine for Harbor Freight. LED flashlight free coupon with purchase. Find tools and more for 80% off and more. Get 10% off your purchase when you get the VIP card at http://www.joann.com/VIP. Double $1 manufacturer coupons up to a limit of 5 with a $25 purchase in grocery or household items. Potential $10 off with five $1 coupons. Must have Shop Your Way Rewards card (free loyalty card). Earn reward discounts at Speedway with grocery, drug, and/or apparel purchase at K-Mart. 20% Off In-Stock Cabinets when you purchase $400 or more. Excludes ready-to-assemble cabinets. Offer ends 2/1/2013. Save up to $10,000 Instantly when you purchase Special Order kitchen cabinets. In store only. Discount applied at checkout. Offer ends 2/1/2013. Get up to 25% off your Old Navy purchase! Use code MYSTERY. Offer ends 1/27. Restrictions apply. M&Ms Snack Mix 8 oz – $1.20 after $5 UP Reward after purchase of 5 and 4 $1 coupons – limit 2 offers. Loreal Go 360 Clean Skin Care – $1.50 after BOGO50% off sale and $5 UP rewards with purchase of 4 and 4 $1 coupons – limit 2 offers. Cover Girl eye shadow – $1.04 after BOGO50% off sale and $3/2 coupon – limit 4 offers. Get a Free Ion Mini Iron with purchase of full size Ion Styling Tool (excludes Hard Hat Dryers) with code 444453! Valid through 1.31.13. Buy 1 get 1 free Velvet Collection with code 444163! Supplies are limited, Ends 1/31! Free AGEbeautiful demi permanent hair color w.purchase of any 2 Agebeautiful hair color. Use promo code 444715! Get a FREE Crocodile Style Bag with any $45 purchase with code 444809! Valid through 1.31.13. 1/25 – 1/26 Only! 10% Off Orders $99 or more with code JAN2013! 30% – 60% off all high efficiency washers. When I got a high efficiency washer and dryer I noticed a big drop in my electrical bill. Plus if you use gas that bill will drop too. 40% off all glass-door dryers. 25% off Contact Lenses + FREE Shipping. Coupon Code: BF25. End Date: 1/31/2012. Buy 1 Get 1 FREE on Photo Greeting Cards. Coupon Code: CARDSBOGO. End Date: 3/2/2013. Buy 25 prints get 25 FREE. Coupon Code: BUY25PRINTS. End Date: 2/2/2013. $300 off Walgreens Travel Scooter by Rascal + Free Threshold Delivery. End Date: 2/2/2013. Take an Additional 61% Off Weight Watchers Magazine. Enter coupon GETFIT2013 During Checkout. Take an Additional 80% Off Family Handyman Magazine. Enter coupon GETHANDY During Checkout. Take an Additional 20% Off FLEX Magazine. Enter coupon WKLYSPEC During Checkout. Deal of the Day valid only on date specified through Midnight EST. Take An Additional 15% Off at Best Deal Magazines. Enter Coupon Code PXCJ0203 During Checkout. Offer expires February 3, 2013. Take an Extra $5 off $30 at Best Deal Magazines. Enter Coupon Code MNDCJ0203 During Checkout. Offer expires February 3, 2013. Take an Extra $7.50 off $40 at Best Deal Magazines. Enter Coupon Code MQQCJ0203 During Checkout. Offer expires February 3, 2013. Take an Extra $10 off $50 at Best Deal Magazines. Enter Coupon Code MQPCJ0203 During Checkout. Offer expires February 3, 2013. Take an Extra $15 off $70 at Best Deal Magazines. Enter Coupon Code MTKCJ0203 During Checkout. Offer expires February 3, 2013. Sat, Jan 26 & Sun, Jan 27, Hobbies, Comics & Games Magazine Sale! Starting at $4.50/year! Get Free Shipping on Any Order (No Minimum) with No Sales Tax! 50% off American fare from Jocko’s Bar and Grill in Broadview Heights. Get $20 worth for $10. 50% off sweet and savory pies at Gray House Pies. Get $30 worth for $15. 50% off party trays from Barrister’s Deli. Get $50 worth for $25. 50-66% off annual discount golf membership from Golf Card International for $29 (reg. $59). 50% off 2-night stay for up to 4 people at Unicoi State Park and Lodge for $69 (reg. $138). 50% off 2-night stay plus breakfast at Charleston Harbor Resort and Marina (not including fees) for $219 (reg. $438). $270 for a 2-night island golf getaway and cruise for 2 at Sea Palms Resort. Get a free lunch bag from Lean Cuisine. Collect and enter 20 NEW codes from inside LEAN CUISINE varieties (excluding LEAN CUISINE bagged products) from January 3—March 31, 2013. Did you make a resolution and need to stick to a goal. This site helps you create a goal AND make you stick to a goal by creating a repurcussion to missing your goal. But it can be a good thing like making a donation to a charity. Sometimes a structured goal helps people so give it a try if you are struggling with quiting smoking, losing weight, or busting a groove at inappropriate times. Ok, so the Browns sold the naming rights to the stadium for $100 million. That’s fine. But what irked me is that a utility company, First Energy, that has a history of passing on rate increases or fees for things they shouldn’t like CFL bulbs got the naming rights. They got fined for hiding problems with the Davis Besse nuclear reactor and have had safety issues with others too. And they also went back on their word when they gave homeowners discounts for making their house all-electric. Can they be trusted not to pass along the costs for the naming rights? What do they need to be more well known for? It’s not like consumers can shop around and get a better deal all that easy. They’re a regional business so who cares if anyone knows who they are in any other state. The stadium’s power is also from Cleveland Public Power! ..because it’s cheaper to do so. Let’s not forget when another energy company, Enron, paid $100 million for naming rights to the Houston Astros stadium. Their name got stripped off after they went bankrupt under many cases of fraud. It made sense that Progressive got the naming rights for the Indians. They compete everywhere and for all consumers. So, I’m going to keep an eye on First Energy. If they have enough money to throw around for naming rights, then they can’t cry poor. The Factory of Sadness doesn’t need to be the Factory of Madness too. I was shopping online on officemax.com and I had a problem with my order. It wouldn’t let me change my credit card to a new expiration date. I called their support and they told me I had to sign up as a guest to get around it. That wasn’t where I ran into the major problem with my order. At that point I had already put in my gift card for the order. Since it wouldn’t take my credit card I couldn’t submit the order. I had to start over. So I did as a guest account. I went to re-use the gift card and it said my balance was $0! I didn’t even submit the order and it took it off! I called Officemax and they had to open a ticket to re-instate the gift card amount of $50. That is shady. I’ll be filing a complaint with the Ohio Attorney General at http://www.ohioattorneygeneral.gov/Individuals-and-Families/Consumers/File-A-Complaint. I’ll let you know if anything else comes of it. With the Super Bowl around the corner aside from all the pizza, chips, and snack deals check the beer islands for beer rebates. There are a lot of different ones available. You’ll find the rebates on the beer case of on the display on a pad. One gets you $8 back when you buy an 18 pack of beer with a pizza. With the great B2G1 Digiorno pizza coupon most everyone already has bought a pizza so it ends up costing around $4 for an 18 pack of beer. Most all beer companies have rebates – Corona, Bud, Miller, Labatts, Sam Adams… Some stores are better about making them available than others. Giant Eagle usually has them on their beer displays. $9 for a 2-piece wine set. Save 59%. 45% off a Flex Force home workout system for $165. Save 45%. $20 for $40 towards personalized jewelry. $13 for a personalized photo iPhone case. $15 for a CZ eternity band. Get this spectacular deal for Niagara Falls! At Facelogic in Fairview Park get a Signature Facial and Brow Design, Oxygen Facial and Peel, or Microcurrent Facial and Anti-Aging Mask (Up to 63% Off) from $39. At Murphy’s Ale House in Valley View get $20 worth of food for $10. At The Lofty Cupcake in Tallmadge get 12 Mini Cupcakes or 6 or 12 Large Cupcakes from $6 (Half Off). 12 Chocolate-Covered Valentine Oreos or One Heart-Sprinkles Giant Fortune Cookie from Lady Fortunes (Up to 44% Off) From $14. $20 for $40 Worth of Valentine’s Day Flowers and Gifts from FTD. Get a free bagel and cream cheese on Feb 7th with coupon in recent Red Plum insert. Heads of Tails? Call it right and win – you must vote by midnight, Saturday, Feb. 2 at http://www.papajohnscointoss.com/! • The day after Super Bowl XLVII, winners will receive an email with a promotion code good for a large FREE PIZZA with 1 topping. • Emails with winners’ promotion codes will be delivered by midnight PST, Monday, Feb. 4. Plus, Get 35% off any regular menu price LARGE PIZZA NOW just for voting! Mattlin-Hyde Piano Company – private liquidation by appointment on 1/25 – 1/26 – call 216-633-0690 – public liquidation begins 1/27. Located at 5109 Mayfield Road. Will businesses start charging a 4% fee for using a credit card? On this segment I chat about it with Jenn Stathman. Learn about the last week’s great Rite Aid deal too for cereal and milk. No worries…there are more good Rite Aid deals this week. Listen at 7:18 AM on Wednesdays to WELW 1330 AM as I go over the deals of the week on the Wake Up Lake County Show. Go to http://www.WELW.com to listen to old podcasts or to listen live. Be sure to register for libraries that require registration as some have waiting lists. I hope to see you there! Get $25 Restaurant.com gift certificates for $5! Regularly $10, it is on sale for 40% off! Use code: DINE. Deal goes through Wednesday, January 23, 2013! There are Yelp deals all across the U.S. Check where you live to see what deals are in your neighborhood. Tattoo Cafe – $20 for $25 Deal – I think this is the first tattoo deal I ever posted. Find accessories for your smart phone of cell phone up to 80% off! 30% discount on the new iPhone 5 Lightning Adapter. Use code lightnadp. No minimum purchase required. Vistaprint offers a lot of great deals for business and personal items. Compare their prices to what Office-max or Staples offers. Get 250 premium quality, color business cards FREE! Customized T-Shirt for Only $6.00! Custom iPhone Cases Just $9.99! 50% off Postcards! Mailing Services Available. $89 for a pair of Ray Ban Wayfarer designer sunglasses. 20% Off All, Plus $50BB On $100+ Orders to Use on Future $100+ Order with code JA18 at AdvanceAutoParts.com!! Ends 1/20! Save 15% On Your AdvanceAutoParts.com purchase with code AAP15OFF until 1/31! Take $10 off $30, $25 off $70 and $40 off $110 orders with code A124! Ends 1/31. Planters cashew halves or mixed nuts – 9/$17.50 after 4 $1/2 coupons and $10 CVS Cash card. Get 20% off any Mug or Mouse Pad. Use code PHOTOGIFT Hurry, offer ends 1.26.13. Save 33% on all photo calendars with code SAVECAL. Offer valid 1.20.13 – 1.26.13. Receive 33% off any Photo Card order. Use code CVSCARD at checkout. Offer Valid 1.20.13 through 1.26.13. Everything in the store is at least 70% off. Final days as they are going out of business. Designer shoes closeout – 2 pairs for $12! Great deal! Save up to 50% off already low prices with their winter clearance. Items as low as $1. Get a Giant Eagle credit card and earn an extra 4¢ off per gallon of fuel for every $50 you spend inside Giant Eagle and GetGo®. Earn 4¢ off per gallon of fuel for every $100 you spend on fuel at GetGo (discount is good on any future fuel purchase). No annual fee. Look for coupon for free item in ad in newspapers. Find other tool deals over 80% off. Up to 70% off clothes in store only. I recently got a BOGO home garden plant coupon. Teachers get an addiational 25% off on 1/20 – 1/21. Starting 1/18, get more and save more at OldNavy.com. Save 15% off any amount, 20% off $100, and 30% off $150! Use code ONSAVEBIG. Offer ends 1/21. Restrictions apply. Click here for a $10 off $50 coupon. Expires 1/20/13. Garnier Fructis Shampoo or Conditioner or stylers – .83 after $5 UP reward with purchase of 5 and 4 $1 coupons and January Video Values for Styler (2 have to be stylers). Rite Aid only allows 4 like coupons. Spend $25 in January and earn a 15% reward coupon for Beauty Club Members. Visit Sally Beauty on Feb 23rd and they’ll make it 30%. 50% off all Fitness equipment. Get an additional 10% off most items when using your Sears credit card on purchases of $299 ore more through 1/21/13. Expires: 1/20/13. 2 days only take $15 off $100 or more purchase online. Bounty Basics paper towels – 8 pack – $4 with coupon in ad. Good price, especially for Staples. Strawberries, blueberries, and blackberries – 2/$3 – good produce prices now with products coming from Chile. Flexaid Joint Formula 90 ct – Free after $20 Mail-in Rebate from January Walgreens Savings Book. Nogii Super Protein Bar 3.4 oz – Free after $2.99 Register Reward. Phase plus Diabetic Foot Therapy 6 oz – Free after $14.99 Mail-in Rebate from January Walgreens Savings Book. Afrin – $1 – drano for the nose! Take an Additional 75% Off Taste of Home Magazine – Enter coupon GOODCOOK During Checkout – Just $4.50 for 1 Year! Take an Additional 80% Off Reader’s Digest Magazine. Enter coupon READER During Checkout – Just $4.80 for 1 Year! Take An Additional 15% Off at Best Deal Magazines. Enter Coupon Code PXCJ0127 During Checkout. Offer expires January 27, 2013. 250+ Magazines under $10 with this coupon! 70+ Popular Magazines – Just $3.99 with this coupon! 30+ Popular Magazines – Just $5.24 with this coupon! Take an Extra $5 off $30 at Best Deal Magazines. Enter Coupon Code MNDCJ0127 During Checkout. Offer expires January 27, 2013. Take an Extra $7.50 off $40 at Best Deal Magazines. Enter Coupon Code MQQCJ0127 During Checkout. Offer expires January 27, 2013. Take an Extra $10 off $50 at Best Deal Magazines. Enter Coupon Code MQPCJ0127 During Checkout. Offer expires January 27, 2013. Take an Extra $15 off $70 at Best Deal Magazines. Enter Coupon Code MTKCJ0127 During Checkout. Offer expires January 27, 2013. Get these deals and more for annual subscriptions. DiscountMags.com offers Free Shipping, No Sales Tax and subscriptions are NOT subject to automatic renewal. 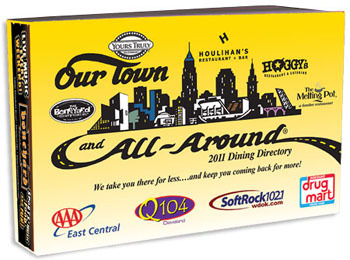 Get the Our Town and All Around coupon book for $28 Plus FREE shipping! A bargain for so many coupons! They make a great gift! * RESTAURANTS – Restaurant coupons include the Boneyard, Slim & Chubbies, Hooley House, Cabana’s, Welshfield Inn, Chocolate Martini Bar, House of Blues, West Park Station, Yours Truly, Harry Buffalo, Pacers, Scrambler Marie’s, Willoughby Brewing, Casa D’Angelo, Quaker Steak & Lube, Punderson Manor, Oriole Cafe, Frankie’s Italian Cuisine, Joey’s, Houlihans, Rock West, Dino’s, White Oaks, Melting Pot and over 140 more! * FINE DINING – 160 Fine Dining Restaurants with savings of $10 or more. Most offer half off dinners for those dining alone! Some are valued up to $32 off! * LITTLE ITALY – NEW this year is our “On the Hill”, a section of Little Italy restaurants such as La Dolce Vita, Maxi’s, Mia Bella, Il Baccio, Anthony’s, Guarino’s, and Primo Vino. * FAST FOOD/PIZZA/LOCAL RESTAURANTS – Over 450 “two for one” or “50% off” offers at fast food restaurants, pizza restaurants, and neighborhood favorites. * WINERIES – 30 coupons for wineries from across Northern Ohio including Ferrante, Paper Moon, and Debonne. * GOLF – Coupons for over 65 BOGO rounds of golf. * MISC. COUPONS – Coupons for dry cleaning, tanning, IGA (five $5 off $20 purchase coupons), Bremecs, and much more! Get a $25 gift card at Discount Drug Mart or $15 gift card at Marc’s with the transferred prescription coupon in the book (have them honored as competitors coupons at pharmacies at Giant Eagle and others). * ALL Coupons good now through December 1, 2013! 1) Call and ask for the Retention department (or billing dept) for you cable, landline phone, internet, cell phone, newspaper, gas, electric, and any other utility or monthly bill company. Ask them what you can do to reduce your bill. Letting them know that you may switch or cancel service helps. The discounts usually last for 6 months or 1 year. When they end call to see what new deals are available. 2) Do you shop at the same stores every week? Try a different one – Aldi’s, Sav-a-lot, CVS, Rite Aid, Walgreens, Marc’s, etc. See if they have better deals than where you are currently shopping. People are creatures of habit. They don’t like to change their routine. Some stores may have much better deals. Also try their rewards programs if you haven’t given them a shot. You may have had a bad experience at one of those stores. Give them another try. After all, everyone needs second chances. 3) If you have a large family, you may not have enough coupons to match up with everything you are purchasing. Get extra papers with coupons in them. The Sun News has pretty much the same coupons as the PD. The Sun newspapers sell for 61 cents at Marcs. Or get the PD for $1.50 (or $1.25 at some stores) on Mondays at Giant Eagle, CVS, Discount Drug Mart, and Speedway. Or try another paper like the News-Herald. You’ll find coupons for stores and restaurants in them throughout the week. 4) Do you have any habits, bad ones especially, that cost you lots of money? Try cutting back or stopping altogether to save money. That includes smoking, drinking, being best friends with the snack machine, and using psychic hotlines. 5) Speaking of the snack machine, instead of buying pop and snacks there get them at the store instead. A 12 pack of pop can be found for the same price as two or three cans of pop in the snack machine. 6) Are you paying for each extra text or call because you are over your limit? Get on a plan that controls you cost. You may be able to make more texts and calls at a lower cost than the overage you’ve been paying! 7) Go to Marc’s and get a gift card for Speedway that gets you 10 cents off per gallon of gas. Also get the Speedway Rewards card so that you earn points for every dollar spent (you can use both). Sign up for e-mails from Speedway when you register your card and you will also get freebies every month. They usually have 1 to 4 different freebies they send via e-mail each month from pop to chips. Check http://www.speedway.com to find their best gas prices around town before you get gas too. 8) Instead of renting video games or movies, buying them, or paying for them online borrow them at the library instead. For free! 9) See if your monthly mortgage would go down if you refinance your house. Rates are still near record lows. Banks can tell you what it would cost to refinance. That doesn’t cost anything. You may end up lowering your monthly bill AND decreasing the amount of years you have to pay off the house. Don’t be scared of all the paperwork or closing costs. Most banks will include the closing costs in the new loan, so there are no up-front costs. 10) If you pay the minimum on your credit card, it’s like paying double on everything you are buying. If you need to chip away at your credit card debt, call up your credit card company to see if they will give you a lower APR. Or switch your balance to one that charges less or 0% as an introductory offer. Make sure after the introductory offer they have average to low rates. Avoid cards with annual fees. Call to have them credited if they do charge one. 1) Don’t cut your hair this year. Please send me a before and after picture if you do. The longest I think I’ve gone is 6 weeks before I start looking like I have the locks of Sampson. 2) Do you get too many catalogs mailed to you and you’re afraid of buying something in them. Just attach a brick to the self addressed envelope and you’ll see the number of catalogs you get dwindle. Or try http://www.optoutprescreen.com or 1-888-567-8688, http://www.catalogchoice.org and http://www.dmachoice.org to get off mailing lists. 3) Don’t buy any clothes this year. Rotate in some old Halloween costumes you have in the attic into your everyday clothes in case you run out of clothes to wear or just for some added pizzaz. 4) This is true! The term ‘don’t throw the baby out with the bath water’ came about because families would use the same water to bathe to save on water in back in the day. The last to take a bath would be the baby, so hence the term. Tell the family you’re going 1800’s this year. 5) Did you pay attention to where all your neighborhood squirrels buried their acorns? I did. Dig them up to make acorn pie or other delicacies. 6) Go fishing! Lake Erie and its tributaries have plenty of fish. Lake Erie is said to have more fish than all the other Great Lakes combined. The ones with two heads always seem to be more flavorful. And the ones with tumors or lamprey eels on them are like bonus morsels. 7) Don’t use any electricity. No lights. No TV. When you want to watch TV, use some binoculars to watch a neighbors TV. One of them is bound to be watching something you want to see. Talk to your neighbors about the shows you like to get them hooked on them. 7 1/2) Telemarketers got you buying all kinds of useless stuff? Blow a whistle into the phone every time they call and you’ll see the calls taper off. 8) Save money by not shaving. Those razor cartridges are crazy expensive! Again, send me a before and after picture. 9) Use crayons for makeup. 10) Use Giant Eagle’s Eagle Nest for all you babysitting needs. Wal-Mart Stores Inc said on Tuesday it will buy an additional $50 billion in U.S.-made products over the next decade in such areas as sporting goods and high-end appliances in a bid to help boost the U.S. economy. Wal-Mart plans to hire 100,000 new veterans over the next five years. I applaud both. They still have a long way to go though. Remember when Wal-Mart made a point that everything they sold was made in the USA. I guess they want to bring back that ‘we’re a good U.S. company’ vibe they had back in the day. They changed from having only made in the USA products to most coming from overseas. Labor in China is getting more expensive so jobs are starting to come back. Companies are also setting up shop in other parts of southern Asia instead of China now. With Crash Combat Games and Adventure Sports get a Mobile Laser Tag Party for Up to 12. Grout and tile cleaning for $59. Get $30 worth of food for $15 at Bubba’s Q in Avon. Bulova men’s watches up to 65% off – from $69. $20 for a 3 pack of Jillian MIchaels DVDs. Get tickets from $14 to The Great Big Home + Garden Show at the Cleveland’s IX Center – over 50% off. Get $50 worth of Spanish and Portuguese food for $25 at Mallorca on West 9th in downtown Cleveland. Get $30 worth of food for $15 at the Corner Alley on East 4th in downtown Cleveland. MONDAY – Half off all appetizers with purchase of a glass of wine. 4 – 11 pm. WEDNESDAY- FRIDAY – Happy Hour from 4 – 7pm – $1 off Featured wine pours. Check out this segment about the 2013 coupon schedule, great deals at Gabriel Brothers, and a free day at the Rock Hall. As you’ll notice by my voice, I am under the weather. Dang flu bug got me. Good thing I got a good stock of cold medicine from all the deals in the past months at Walgreens, CVS, and Rite Aid. Get these coupons and over 200 more on Coupons.com. Most all stores take internet coupons. They will double at stores as per their rules – Giant Eagle, Dave’s Supermarket, and Buehlers doubles coupons of 99 cents and less. Each coupon can usually be printed twice. Get them before they disappear! Extra 50% off winter clearance. Clothes for $1, $3, $5. ENTERTAINMENT BOOKS $18 PLUS FREE SHIPPING! All books are $18 each plus FREE SHIPPING! Deal goes through Wednesday, January 16, 2013. Get one now! Great to use on vacations to wherever you travel. You are currently browsing the JoeTheCouponGuy.com Deals Blog blog archives for January, 2013.